After a two hour-long train ride from Venice, we arrived in Trieste. 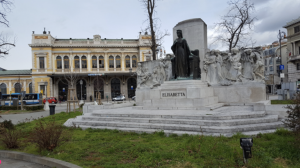 We were greeted outside the train station by a statue of Elisabeth of Bavaria, Empress of Austria and Queen of Hungary. The buildings looked different than those we had seen in Rome and Venice. Immediately, we were reminded of Trieste’s complex identity, marked by both its past within the Austro-Hungarian Empire and its Italian present. We headed straight to the Museum of the Jewish Community of Trieste. 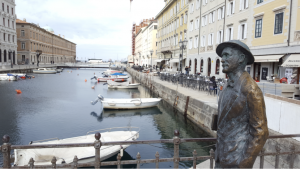 On our way there, we came across a statue of Irish author James Joyce, who wrote several of his works while living in Trieste and whose novel Ulysses we had studied in class. We arrived at the Museum of the Jewish Community of Trieste, which told the story of the over seven centuries of Jewish presence in the city. We learned that the community originates from a few Ashkenazi families that moved to Trieste during the Middle Ages. Trieste’s Jewish community grew throughout the Habsburg Monarchy, driven by events such as Joseph II’s Edict of Tolerance in 1782 (which granted religious freedom to Jews) and an influx of approximately one thousand Sephardic Greek Jews fleeing Corfu in 1891. After Trieste’s annexation to Italy until World War II, the community continued to grow: before World War II, Trieste housed the third largest Jewish community of Italy (after Rome and Milan). The exhibits in the museum also explored the lives of many Jewish authors and scholars whose works we had studied in class, including Samuel David Luzzatto, Italo Svevo, and Umberto Saba. One interesting discovery I made during the visit of the museum was that during World War II, around 150,000 Jews from Central and Eastern Europe transited through Trieste on their way to Palestine (as well as other safe destinations such as the Americas), and that the building where I was standing had in fact served as the local seat of the Misrad, the committee for the assistance of Jewish emigrants. Next, we visited the Svevo and Joyce museum, where we were greeted by Riccardo Cepach who spoke to us about the unique relationship between authors James Joyce and Italo Svevo, highlighting objects around the room that reflected the history of their relationship and their literary works. 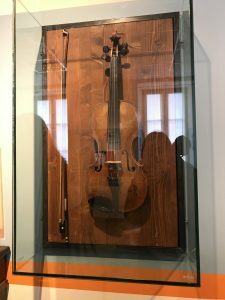 One object that struck me was Svevo’s violin that was mounted on the wall. 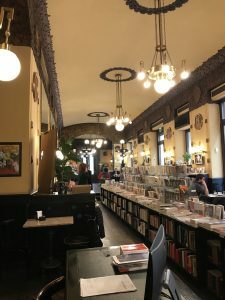 Riccardo explained how the violin, as well as Svevo’s attachment to cigarettes, were two things that Svevo transferred from his life into his characters. This detail added a layer of richness to the character of Zeno from Svevo’s Zeno’s Conscience which we read in class. 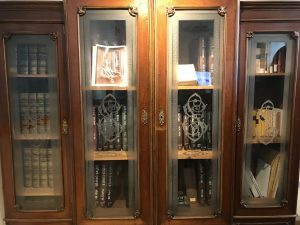 Svevo’s bookcase also stands in the museum, and is monogrammed with the letters “E” and “S,” the initials of Svevo’s given name. This stood out to me as a permanent symbol of Svevo’s Jewish origins. After visiting the museums, we headed to Café San Marco for lunch. As we sat at the cafe, I couldn’t help but look around and observe for myself the place that was described in great detail in one of our readings. Being able to physically sit in a cafe that inspired a class reading was an enriching experience. 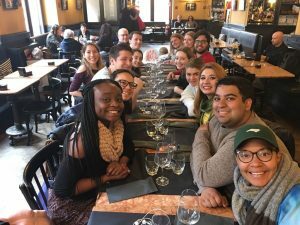 Our lunch in Trieste was one of the most glaring reflections of our readings that we experienced while in Italy. Finally, we headed for a tour of the Synagogue of Trieste, which was completed in 1912 and is the largest synagogue in Italy. 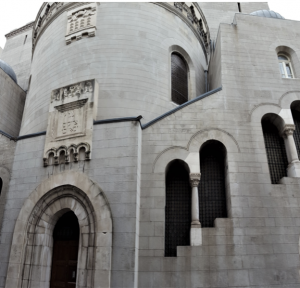 There were approximately 6000 Jews in Trieste before World War II, and this large and ornately decorated synagogue was built to meet the needs of this growing community. The outside of the Synagogue of Trieste. Unfortunately, photos were not allowed inside! During World War II, other synagogues in Trieste were destroyed, but this one was kept because there were plans to repurpose it once the war was over. Even more surprising, our guide told us that the Torah and other religious artifacts also miraculously survived the war, hidden in a secret room within the synagogue that was only discovered well later during renovations of the synagogue. Today, the Triestine Jewish community is small (around 560 members) and the main part of the synagogue complex is no longer used, but there are still daily services held. Sephardic rites are used during the weekdays, and Ashkenazi rites are used on Shabbat and for holidays, an interesting reminder of the history of Jewish migrations to Trieste. Finally, we headed back to the train station to head back to Venice. 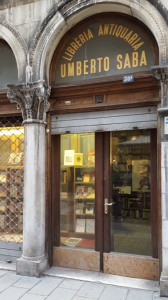 On the way there, we passed Libreria Antiquaria Umberto Saba where Saba himself once worked, a final reminder of Trieste’s rich literary past.